Habit: Annual, perennial herb, hairy, taprooted, red root dye present or not. Stem: erect. Leaf: generally cauline, +- sessile, entire. Inflorescence: panicle-like cyme or flowers 1 in upper leaf axils; bracts throughout. Flower: calyx deep-5-lobed, enlarged in fruit, lobes equal; corolla 5-lobed, funnel-shaped or salverform, generally +- yellow (+- white), tube > lobes, appendages present or 0; style entire. Fruit: nutlets 1--4, 2.5--6+ mm, ovoid, plump, smooth to pitted or wrinkled, attachment scar basal. Species In Genus: 75 species: worldwide, generally temperate, mountains. Etymology: (Greek: stone seed) Note: Heterostylous or not; cleistogamous flowers present or 0. Habit: Perennial herb, strigose; caudex woody; red root dye present. Stem: few--several, 1--3 dm, clustered, +- unbranched. Leaf: many; blade 1.5--6 cm, linear to linear-oblong. Inflorescence: cymes many, in upper leaf axils; pedicels 2--5 mm, +- recurved in fruit. Flower: corolla 15--35 mm, 2--3.5 × calyx, 10--20 mm diam, salverform, yellow, tube long, lobe margin jagged, appendages yellow. Fruit: nutlet 2.5--3.5 mm, ovoid, acutely tipped, +- pitted, shiny, +- gray. Chromosomes: 2n=24,36. Ecology: Sandy, rocky slopes, pinyon/juniper woodland; Elevation: 1650--1700 m. Bioregional Distribution: se DMtns (Keystone Canyon, New York Mtns, San Bernardino Co.); Distribution Outside California: southern Nevada, to eastern British Columbia, Montana, Great Plains. Flowering Time: Apr--May Note: Homostylous; small green fertile cleistogamous flowers present. 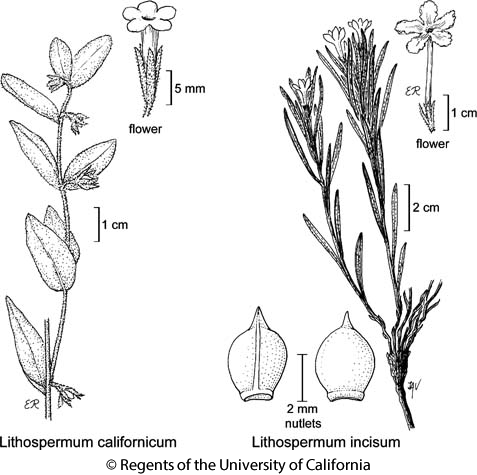 Citation for this treatment: Ronald B. Kelley 2012, Lithospermum incisum, in Jepson Flora Project (eds.) Jepson eFlora, http://ucjeps.berkeley.edu/eflora/eflora_display.php?tid=31261, accessed on April 20, 2019.
se DMtns (Keystone Canyon, New York Mtns, San Bernardino Co.); Markers link to CCH specimen records. Yellow markers indicate records that may provide evidence for eFlora range revision or may have georeferencing or identification issues. Purple markers indicate specimens collected from a garden, greenhouse, or other non-wild location.